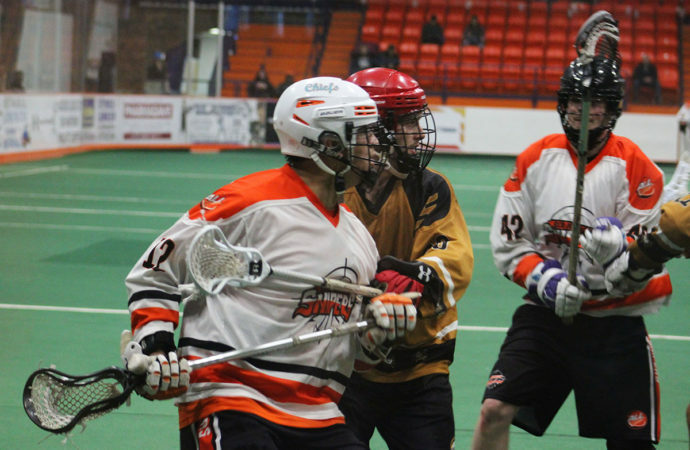 SIX NATIONS — After a strict losing streak, the Six Nations Snipers met up with the St. Catharines Shockwave and rocked their full season win streak at the Iroquois Lacrosse Arena last Sunday. The first period opened with two goals for the Shockwave after the Snipers were called for too many men. But they were able to answer twice further into the period with Tyler Brown scoring his first from Wayne Vanevery and Ian Martin, and Vanevery scoring himself from Brown and Ashton Jacobs. The Shockwave returned another however, closing the period with a lead 3-2. The second opened with three goals from the Snipers, each by Justin Martin from James Chadwick, Skye Sunday from Brown and Jake Lazore and Brown from I. Martin and Sunday. This was flanked by two goals from the Shockwave, which brought the game to tie. The third was a heavily defensive period as scoring slowed on both sides. The Shockwave got away with two goals and so did the Snipers with buries from Sunday for his second and Brown for his third, taking the lead 8-7. The fourth period however, allowed the Snipers to take off. Although the Shockwave were able to tie the game up briefly at the start, Brent Longboat buried from Vanevery and Travis Longboat and J. Martin scored his second from Reilly Hess seconds later. A few minutes later, Sunday buried his third from Brown and Brown scored his fourth from B. Longboat and Vanevery. Two penalties were awarded to the Shockwave for checking fro behind and illegal cross check. But the Shockwave returned one more, before J. Martin scored unassisted and T. Longboat went for his first from Vanevery and I. Martin. This brought the period and game to a close with the Snipers on top 14-9. Top three players of the game went to all Snipers players including: Lazore for his work in net, Brown for his four goal and three assist streak and J. Martin for his hat trick. Their next game will take them to the Children’s Arena to face the Peterborough Timbermen on Saturday, March 30 at 3 p.m..